Back in Nov of 2008 I checked out Zenwalk 5.2 and a recent LXF contained Zenwalk 6.0 – so let’s see what has changed. It loads up with the usual Kernel messages going past on the screen. The first screen for the installation hasn’t changed one bit from Zenwalk 5.2. Once again, as before, I chose autoinstall. Once again, the installation was sparse, but very, very informative. I don’t think I mentioned this last time, but it appears that Zenwalk 6.0 (maybe earlier versions as awell) uses the xfs file system instead of the more usual ext3. (Or, recently, ext4) According to the wikipedia article I linked to, XFS is very good for large files and is one of the oldest file systems for *nix systems. Just like last time, the installation had information on every single package as it was installed. Just as last time I want to say that this installation was very, very simple. I don’t see why anyone new to Linux (but not a total computer noob) would have any problems installing it. Sure, it’s very short on eye candy – but who cares? You should only ever see the installation screen once. Just as before, I am convinced that Zenwalk is a very good introduction to a Slackware-type distribution thanks to this ease of installation. Installation took a little while. Overall, it appears the Zenwalk team have decided to maintain the same visual theme from the 5.2 release. I can’t speak to what things looked like before that because I never used an earlier version of Zenwalk. I then installed the LILO boot loader as before. Then it was time to reboot. Many thanks to the person (I’m pretty sure it was a guy) in the IRC under the handle of stillborn1. So now we can move on. Ok, the background is a little different and the Zenwalk logo has a little more colour, but overall, it looks the same as Zenwalk 5.2. So I go ahead and login. The desktop looks exactly the same as in 5.2 but with a different background picture. But, hey, if it’s not broke – don’t fix it! They also seem to be using the same icon set as before. Ok, so before I faulted Zenwalk for not labeling Netpkg in their settings page as being the program for installation. Let’s see if that’s the same. It’s now found under System -> Control Panel. And it’s still only called Netpkg. HOWEVER, one user did comment last time that new users should read the documentation where this is all spelt out. So, I’m not going to beat that horse. Basically everyone will fall into one of two camps – you think people will read the manual or you think they won’t. And that’s what dictates your settings. Program-wise Zenwalk 6.0 is running OpenOffice.org 3.0 and Iceweasel (Firefox) 3.0.6. 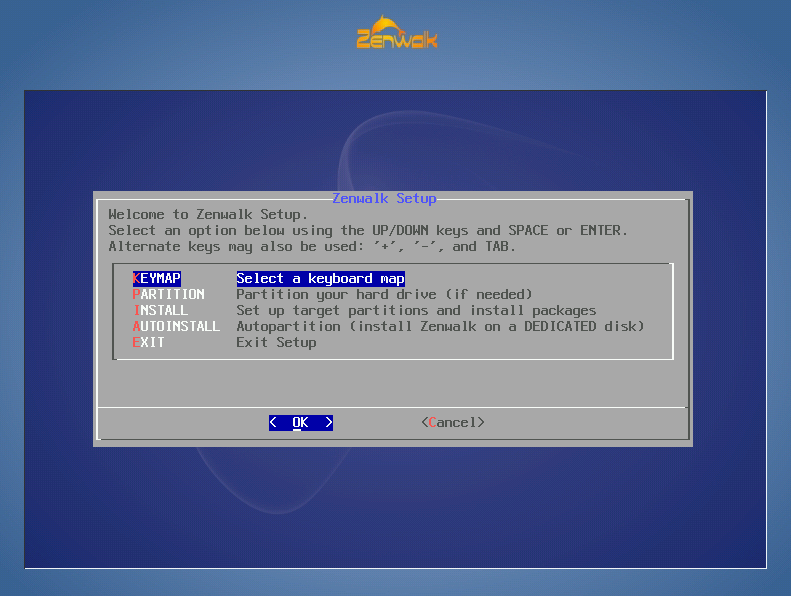 Other than that, the basic install of Zenwalk has a small selection of programs. They follow the same trend that nearly all distros are following now – initially give the users one program per task and let them discover other programs later. To get a feel for the depth of the Zenwalk repositories, I decided to search for two programs only being added to the latest distro releases – Conky and Gwibber. This time Netpkg GUI says, “No mirror selected – select on and load it.” A HUGE improvement over Zenwalk 5.2. Conky was available, but Gwibber was not. Darn – again something non-intuitive. If you don’t click on the filter “not installed” you can’t select it for installation. This is quite a bit annoying and counter-intuitive. Come on – don’t fix one thing and break another! Ok, so what’s the conclusion for this Slackware-based or Slackware-derived distro? Let’s start with the good stuff. Installation is very simple. If you aren’t automatically scared by the fact that it’s not a GUI, it’s pretty darned easy. It still would be nice if there was a little bit more explanation on what the user is choosing, but I guess if you’re installing a Linux distro you can be expected to do a bit of research or revoke your license to gripe. As before the desktop is beautiful (at least for me) and the icon set is nice. The default setup makes sense. It works well. Last time I checked out Zenwalk I had not yet tried Slackware. After having tried Slackware – Zenwalk is easily a much friendlier distro to get up and working. Now for the negatives. First of all, the problem with the vesa driver is a major issue, but it won’t affect everyone. I was left scratching my head because I couldn’t figure out what was going wrong and I knew how to check the Xorg logs. After all, vesa is supposed to be the fallback. Again, this probably won’t affect you too much. Another negative, but a really tiny one is that Firefox is called Iceweasel. Debian does this as well. Both are distros that most people probably wouldn’t try as their first distro, so I guess it’s ok. But if I were to hand it to someone and say try out this Linux thing and they can’t find Firefox they might panic a bit. I understand why Debian does it and I assume Zenwalk does it for the same reasons. No need to rehash that argument, but it is true that it will be a [very small] stumbling block for the new user if they don’t read the manuals. Finally, there’s Netpkg. I have to give the maintainers props for fixing the issue before where it would just sit there and not give you any instructions whatsoever. However, having to manually check the filter “not installed” is quite annoying. Given these design issues and seeing how they could logically fit in, I think it’s clear Zenwalk is a distro for people who are more technical or geeky and just don’t have the patience to deal with Slackware and its non-dependency-calculating nonsense. Ok, so I’d say Zenwalk is a good, beautiful distro. I would only recommend it to a new user if they have done their research on this Linux thing. They need to know how to find help or why Firefox is called Iceweasel or they need to have a geek friend they can ask. For Linux veterans, Zenwalk seems nice and easy. It seems to give all the power of Slackware with none of the (IMHO) BS. The repos are not as large as Fedora or Ubuntu, so check that you don’t need programs that aren’t there or are ok with compiling software. I’m still of the opinion that anyone who is unhappy with his or her current distro should try this one out. You may find it to be a good fit. It has nice, light requirements including Pentium 3 and 128 MB RAM so it might be great for resurrecting some old computers without having to resort to a “light” distro. It’s also good if you like Xfce or Gnome. There does not appear to be an official KDE version. Noticed spell check doesn’t work in openoffice even after several attempts to fix it. Has anyone else had this problem? Not sure this is the best place to get help for that. But thanks for bringing it up. Sorry, I thought the fact that spell check didn’t work might be a valid addition to the review. You know what bugs me though is spell-checkers that can’t handle proper nouns. Isn’t it ridiculous that we still can’t type out 500 pages of text without having red lines all over the place? “Nixon” is in the dictionary, but “Obama” isn’t. Microsoft is in, but Unix commands like ‘grep’ and ‘chmod’ aren’t. Even ‘IceWeasel’ isn’t recognized! It’s a shame some internal discords made the support and update of the Gnome version really uncertain; it’s so difficult to find a Slackware (or derived) with Gnome! Great review. I have been meaning to give 6.0 a try for a long time now. Guess I will stick with Arch for now. I find in astonishly beautiful. No installation problems here. In fact it is one of the few that installs on my laptop (liked Ubuntu too, but would’t installl). Very stable, good performance. internet, network, mp3, all kind of movies, usb devices, all works straight out of the box. This is what I was hoping for as a XP user.